Ben Shariati is the Assistant Director of the UMBC Graduate Cybersecurity Program, overseeing the program’s expansion to (and operations at) the Universities at Shady Grove in Rockville, MD. Additionally, he teaches or has taught CYBR 620, 650, and 691. 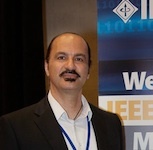 He is a technology and business executive with over 20 years of experience specializing in strategic and operational cybersecurity program activities and development for international organizations. His research and professional interests include mobile device security, emerging technology evaluation, risk analysis, audit, and compliance. Ben received a Ph.D. in Information Assurance in 2016 from the George Washington University in Washington, DC. He is a member of the Institute of Electrical and Electronics Engineers (IEEE), the Information Systems Audit and Control Association (ISACA), and is NSA/NSTISSI 4011 INFOSEC certified.